The dsp.ComplexBandpassDecimator System object™ extracts a specific sub-band of frequencies using a one-sided, multistage, complex bandpass decimator. The object determines the bandwidth of interest using the specified CenterFrequency, DecimationFactor and Bandwidth values. Create the dsp.ComplexBandpassDecimator object and set its properties. bpdecim = dsp.ComplexBandpassDecimator creates a System object that filters each channel of the input over time using a one-sided, multistage, complex bandpass decimation filter. The object determines the bandwidth of interest using the default center frequency, decimation factor, and bandwidth values. bpdecim = dsp.ComplexBandpassDecimator(d) creates a complex bandpass decimator object with the DecimationFactor property set to d.
bpdecim = dsp.ComplexBandpassDecimator(d,Fc) creates a complex bandpass decimator object with the DecimationFactor property set to d, and the CenterFrequency property set to Fc. bpdecim = dsp.ComplexBandpassDecimator(d,Fc,Fs) creates a complex bandpass decimator object with the DecimationFactor property set to d, the CenterFrequency property set to Fc, and the SampleRate property set to Fs. bpdecim = dsp.ComplexBandpassDecimator(Name,Value) creates a complex bandpass decimator object with each specified property set to the specified value. Enclose each property name in quotes. You can use this syntax with any previous input argument combinations. Center frequency of the desired band in Hz, specified as a real, finite numeric scalar in the range [-SampleRate/2, SampleRate/2]. Fs –– Sample rate specified through SampleRate property. BW –– Bandwidth of interest. TW –– Transition width specified through the TransitionWidth property. 'Decimation factor and bandwidth' –– The decimation factor and the bandwidth of interest are specified through the DecimationFactor and Bandwidth properties. Factor by which to reduce the bandwidth of the input signal, specified as a positive integer. The frame size (number of rows) of the input signal must be a multiple of the decimation factor. This property applies when you set Specification to either 'Decimation factor' or 'Decimation factor and bandwidth'. Stopband attenuation of the filter in dB, specified as finite positive scalar. Transition width of the filter in Hz, specified as a positive scalar. Width of the frequency band of interest, specified as a real positive scalar in Hz. This property applies when you set Specification to either 'Bandwidth' or 'Decimation factor and bandwidth'. Passband ripple of the filter, specified as a positive scalar in dB. true –– The first stage of the multistage filter is bandpass (complex coefficients) centered at the specified center frequency. The first stage is followed by a mixing stage that heterodynes the signal to DC. The remaining filter stages, all with real coefficients, follow. false –– The input signal is first passed through the different stages of the multistage filter. All stages are bandpass (complex coefficients). The signal is then heterodyned to DC if MixToBaseband is true, and the frequency offset resulting from the decimation is nonzero. true –– The object heterodynes the filtered, decimated signal to DC. This mixing stage runs at the output sample rate of the filter. false –– The object skips the mixing stage. This property applies when you set MinimizeComplexCoefficients to false. Sampling rate of the input signal in Hz, specified as a real positive scalar. y = bpdecim(x) filters the real or complex input signal, x, to produce the output, y. The output contains the subband of frequencies specified by the System object properties. The System object filters each channel of the input signal independently over time. The frame size (first dimension) of x must be a multiple of the decimation factor. Data input, specified as a vector or a matrix. The number of rows in the input must be a multiple of the decimation factor. Output of the complex bandpass decimator, returned as a vector or a matrix. The output contains the subband of frequencies specified by the System object properties. The number of rows (frame size) in the output signal is 1/D times the number of rows in the input signal, where D is the decimation factor. The number of channels (columns) does not change. The data type of the output is same as the data type of the input. The output signal is always complex. Compute the implementation cost of a complex bandpass decimator using the cost function. Create a dsp.ComplexBandpassDecimator object. Set the DecimationFactor to 12, the CenterFrequency to 5000 Hz, and the SampleRate to 44,100 Hz. Compute the implementation cost of cbp using the cost function. Compute the complex frequency response of a complex bandpass decimator using the freqz function. Create a dsp.ComplexBandpassDecimator object. Set the DecimationFactor to 12, the CenterFrequency to 5000 Hz, and the SampleRate to 44100 Hz. Compute and display the frequency response. 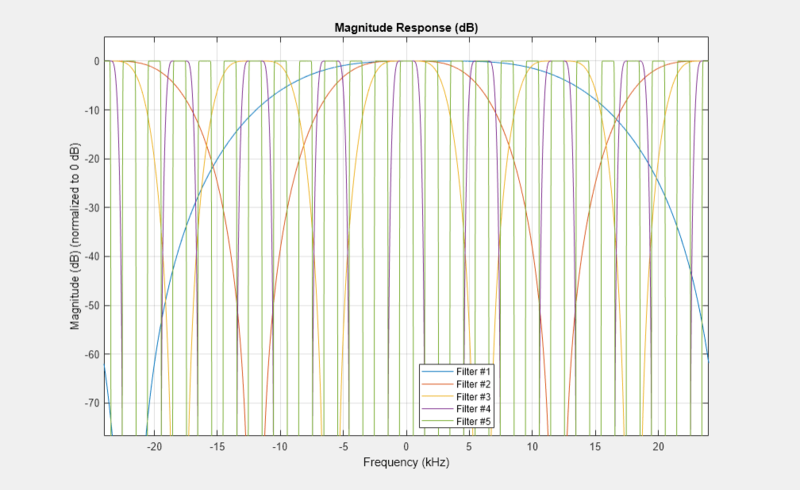 Filter an input signal through a complex bandpass decimator and visualize the filtered spectrum in a spectrum analyzer. 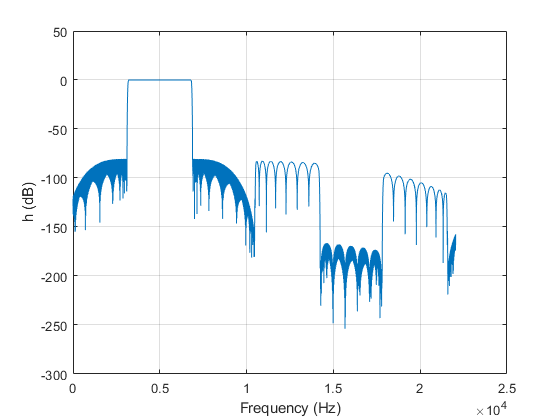 Create a dsp.ComplexBandpassDecimator System object™ with center frequency set to 2000 Hz, bandwidth of interest set to 1000 Hz, and sample rate set to 48 kHz. The decimation factor is computed as the ratio of the sample rate to the bandwidth of interest. The input to the decimator is a sine wave with a frame length of 1200 samples with tones at 1625 Hz, 2000 Hz, and 2125 Hz. 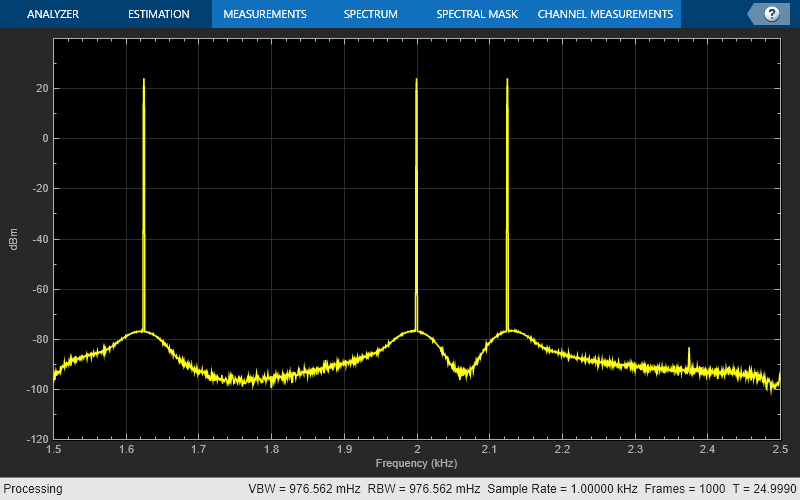 Create a dsp.SpectrumAnalyzer scope to visualize the signal spectrum. Using the visualizeFilterStages function, you can visualize the response of each individual filter stage using FVTool. The info function displays information about the bandpass decimator. Construct a for-loop to run for 1000 iterations. In each iteration, stream in 1200 samples (one frame) of the noisy sine wave and apply the complex bandpass decimator on each frame of the input signal. 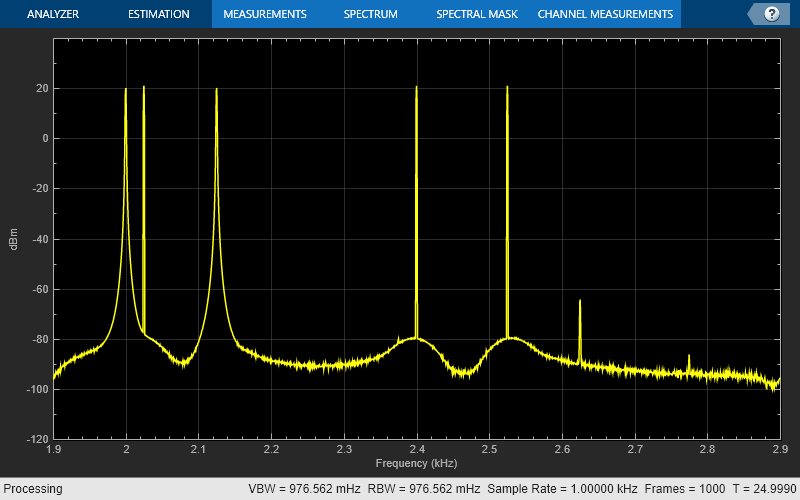 Visualize the input and output spectrum in the spectrum analyzer, sa. The bandpass decimator with center frequency at 2000 Hz and a bandwidth of 1000 Hz passes the three sine wave tones at 1625 Hz, 2000 Hz, and 2125 Hz. Change the center frequency of the decimator to 2400 Hz and filter the signal. 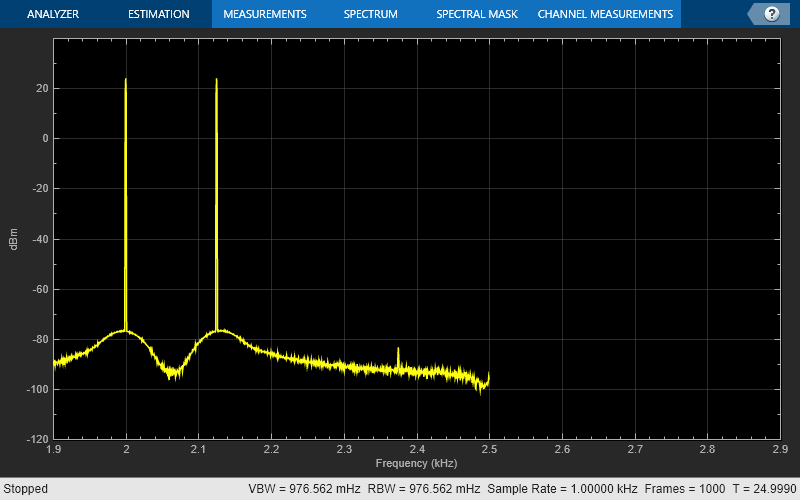 Configure the spectrum analyzer to show the bandwidth of interest, [-1900, 2900] Hz. Stream in the data and filter the signal. The tones at 2000 Hz and 2125 Hz are passed through the decimator, while the tone at 1625 Hz is filtered out. The complex bandpass decimator is designed by applying a complex frequency shift transformation on a lowpass prototype filter. The lowpass prototype in this case is a multirate, multistage finite impulse response (FIR) filter. The desired frequency shift applies only to the first stage. Subsequent stages scale the desired frequency shift by their respective cumulative decimation factors. For details, see Complex Bandpass Filter Design and Zoom FFT.